There's one of those run-up-to-the-Budget articles in the Observer today about how you can ease the pain of the impending tax rises and one of the areas they focus on is food. Apparently the Food Price Index rose for the eighth successive month last month (by 2.2% since January) as I'm sure you'll have noticed yourself with commodities like tea, coffee, pasta, bread and veg having taken the biggest hit. The advice is not rocket science - substitute own brands for branded goods, shop at a less expensive supermarket, set a budget and shop online (not sure about that last one) but the best specific tip is one I was about to post myself which is that tortilla chips are much cheaper than crisps because they don't attract VAT. 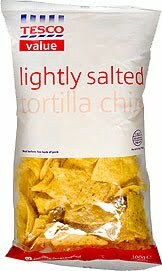 In Tesco you can buy a big pack of their 'Value' tortilla chips for just 25p. Other anomalies are that cream gateaux are cheaper than arctic roll, chocolate chip cookies cost less than chocolate covered ones and unshelled nuts are cheaper than shelled nuts. According to this article in the Telegraph if you buy dried fruit and nuts in the baking section you're likely to pay less than if they're packaged as a snack. Oddly ready made desserts like mousses are also cheaper than sorbets or ices which incur VAT. And takeaway food is VAT-rated whereas ready meals aren't making a supermarket pizza almost invariably cheaper than one you buy from a pizza delivery firm. In Waitrose today I spotted two huge Pizzeria pizzas for £5. If you want to plough through it you can find the official HMRC list here. Thanks for that advice, I am finding it so difficult to keep control of the food budget. I got many value items today - needs must. I am however, concerned where it will end. The big issue is whether you make a list or not, I think and that depends on your personality/skill at cooking. If you're prone to impulse buys it's probably better to make one but I generally prefer to see what's on offer and then decide what we'll eat. The danger of online shopping IMHO is that you don't get everything you need then end up going out to the shops anyway. 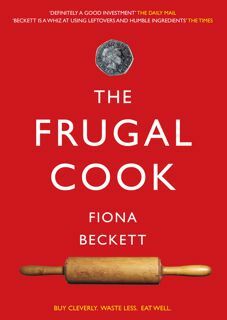 Of course the best way to be frugal is to make as much from scratch as you can since the ingredients don't have VAT on them so better value but time is a big factor for many people. Last week I bought 4 pizza (15inch),2 garlic baguettes and 2 bags of salad from Sainsbury.Grand total of £10. Keeps the nephew and nieces happy before the 2 hour journey home. I agree that it is not necessarily cheaper to cook for yourself, especially on your own. Many, many items are not packaged for one and cannot be frozen easily or very successfully. There are many items I never buy for this reason - cauliflower, savoy cabbage, many cured meats and so forth - either too large for one, get fed up of them, or they go off before I can finish them. I suppose I should buy what I need from deli counters, but I'm just not that organised. No, absolutely well-justified rant, C.
The thing I've noticed over the 3 years since I started the blog is that the old rules no longer apply. As you say it's not always cheaper to buy loose produce (though it is generally in a market) and seasonal produce isn't necessarily cheaper. It drove me mad that home grown rhubarb was more expensive than out of season Spanish strawberries last month. You just have to be incredibly observant, know roughly what things should cost and be able to spot what's a genuine bargain in any given week. I bought a pack of dried chickpeas recently, something like a kilo for a good price (can't remember how much exactly), and have been making humous and felafel. Yesterday I was in a garden centre and saw a tiny packet of dried chickpeas for sprouting to eat in salads. It was a similar price I'd paid for the kilo, but was about 100g. This made me wonder whether I could sprout the ones I have, and of course I can. I just have to leave them in water to rehydrate and then put them in my sprouter. The garden centre was making a delicacy of a standard product and charging accordingly. I quite often make a shopping list online through the Mysupermarket website, so that I know exactly what I'm going to spend and what to look for, then physically go to the shop, and adjust if necessary or if I see some sort of bargain. The thing I find difficult is seeing something on offer and fitting it in to what I'm planning to cook for the week - if I think I'm going to end up buying lots of extra stuff to go with bargains, it's not necessarily a saving. It all takes so much time though! I also make a list of essentials - anything I've run out of - and leave the rest to special offers. I go shopping once a week only so have to get it right first time! Very good tip about chickpea sprouts, Sarah. What do they taste like? I agree on the sorry state of affairs where it is not better to cook from scratch. We're about to buy a house and get married also in the summer, and we have no spare pennies at all at the moment. I'm good at managing, but I find that reduced price ready meals (which can be grabbed when spotted and put in the freezer) are far cheaper than anything I can make myself - and if you spot them in Marks and Spencers then they're pretty good quality (as well as things that I wouldn't faff around with making such as fish pie or cannelloni). I know, Verity. It's really depressing. I think home cooking really comes into its own when you're cooking for a family or for friends. And after a while ready-meals pall but no doubt about it if you're working and haven't much time to shop or cook midweek they can be a boon. I haven't tried chickpea sprouts yet. I only saw the potential when I was in the garden centre yesterday and have yet to put some to soak. Supermarkets prefer to devote space to ready meals as the mark ups are higher for them than it is for scratch ingredients. But customers will have to resist by buying scratch ingredients to make proper meals even if it's a sime spaghetti bolognese. But the message of saving time and effort seems so attractive in these busy days.